Adelman’s conservatism with his personnel resulted in an offense that would sputter most of the game, with Shane Battier scoring only 2 points and Chuck Hayes scoring 4 points on 2-of-7 shooting. You know, the same ol’ same ol’. There must have been 3 to 5 times where Hayes either chunked up a layup for an airball, or had passes or balls slip through his hands. Sure, Hayes had 11 rebounds, 4 assists, 2 steals, and 2 blocks. Those are great stats. But the Rockets need an offensive threat inside to help out Yao, especially when Battier scores only 2 points and almost never takes it into the paint. And forget about it if Hayes is fouled and has to go to the line. That stroke & hitch he has in his free throw stroke is not reliable whatsoever, unless you count the number of lane violations from opponents who enter the lane too early at the top of his release. Bonzi chipped in with 8 points on 3-of-5 shooting, but he missed 7-of-9 free throws. He has never been that great of a free throw shooter, so I don’t know how they rely on him in clutch time over the long haul. But he did take it strong to the hole on at least 3 different occasions, which the Rockets need. But if he’s going to miss 7-of-9 again from the foul line again, then he doesn’t even need to worry about playing. Speaking of those missed free throws, I could write an entire blog post on how much of a joke it was that the team missed so many of them, including Tracy McGrady who was 0-for-5. There is an obvious dark side to a team making 6-of-22 free throws, and that’s the fact the Rockets continue to fold when the pressure is on, either it be at the free throw line, or on the scoreboard as they give up big leads. But there may be a bright side to all those missed FTs. There is probably no more of an embarrassing stat than those 6-of-22 numbers, and the fact they did it in front of thousands of people at Toyota Center, and in front of a national TV audience. Something tells me they are finally going to be very motivated to put in a lot of time in practice on their free throws. If this experience doesn’t motivate these guys to work on their FTs under simulated pressure, nothing will. For the Rafer Alston-lovers out there (not many of them left, I suppose), he had a decent game scoring 10 points on 4-of-8 shooting, including 2-of-6 from three-point territory. I still think that’s too many 3-point attempts for a player like him shooting so poorly from way out there (will Idle-man ever have a talk with him about that?). I would be okay with Alston if he could be consistent with decent shooting, low turnovers and average assists (1 and 6 on Wednesday night, respectively). But I bet you he can’t put together 5 games in a row like this game. Yao played a fairly solid game when the Rockets needed it. He scored 21 points on 9-of-21 shooting, grabbed 13 boards, dished 3 dimes, had 4 blocks, and had only 2 personal fouls. He was very special in the fourth quarter when he threw a beautiful outlet pass to Bonzi within a nanosecond after grabbing a rebound, and he made some big shots in the paint, too. In a tight game that was 66-63 about midway through the fourth quarter, Yao made an impressive spin move on the baseline, elevated, then threw down a ferocious one-handed slam that was NASTY! That made it 68-63, and to me was the play of the game that kept the Rockets from collapsing while Detroit was making their charge. Before Yao made that move, you could just see the Rockets’ throat constricting from the pressure. Yao then hit a big jump hook that was a thing of beauty with 1:58 remaining to make it 79-71 right before the Pistons would hit a couple of three-pointers to make the game a nail-biter in the game’s final seconds. Yao could have made the game less suspenseful it if he hadn’t missed a jumper at the free throw line with 22 seconds in the game or made both free throws with less than a second remaining. But this season, hardly anything is coming easy. Okay, let’s talk more about McGrady. He was a decent 13-of-25 from the field and scored 29 points. He also had a vicious dunk himself at the end of the first half when he took it one-on-one from the top of the key, took it into the lane, and threw it down with authority and purpose, like to vent all that frustration he has had for the past few games. As great as he was statistically and was on that move, though, I swear he had about 4 brain-dead plays where he just stood there with the ball and jacked up a shot without getting anyone involved. He can be so brilliant at times, and a numbskull just a couple of minutes later. I don’t think I’ll ever understand McGrady’s dalliances into “low basketball IQ” territory, as JVG would say. One bright side is that Luther Head got some decent playing time and provided another spark. Although he just scored 6 points, he played 19 minutes to give Alston and McGrady a break from handling the ball at times. He hit a three-pointer, which is always welcomed, and one of my favorite plays occurred after he missed a three-pointer. Yao grabbed the rebound from his missed trey attempt, and Luther hustled to run into the lane where Yao rewarded him with a perfect pass for a layup. You haven’t seen much of that lately. * A lot of loose balls seemed to go their way – some through determination to get the ball, and others just through the lucky bounce of it. * Decent 3-point shooting (6-for-15), which was incredibly better than their free throw shooting (6-for-22). It’s about time the Rockets had some success in these three areas – they haven’t had much of it this season. This entry was posted on Thursday, December 13th, 2007 at 1:27 am	and is filed under vs. Detroit. You can follow any responses to this entry through the RSS 2.0 feed. Have any one noticed that Rocket’s recent wins were because of the poor shooting of the other team and not the good performance of Rocket ? We may not like Rafer but it may not be a coincidence Rocket lost all the games during his absence. He is the only performing point guard (not outstanding)that we have pending the return of a better Francis. Adleman has turned the Rockets into a CONTENDING TEAM for a lottery spot. i don’t know what your fixation is on mike james and rafer alston. i would take alston over m james ANYDAY. it is clear when rafer was out that the rockets offense was even more horrendous because tmac had to be the PG and opponents just keyed in on him from the very outset. for all his shooting faults, rafer is the best PG we have not who can set the table. selfish M James SHOULD not play much at all, since even his scoring is gone most of the time. and one more thing, you are way too soft on yao. many times last night yao let wallace push him out of the paint. 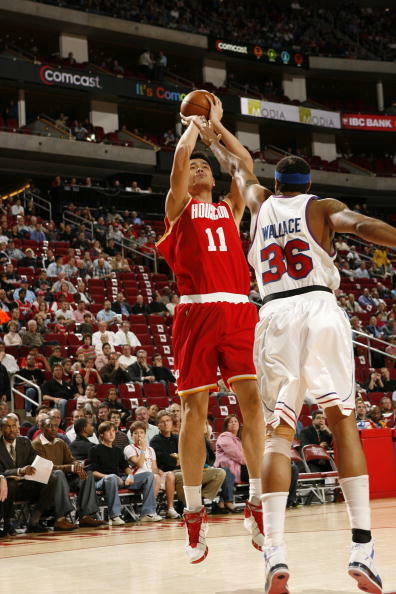 yao did not get the ball in the ideal areas and therefore he passed back out many times or simply took bad shots. he should either be in the low post or high post. many times last night he was in neither places but instead let a guy 7 inches shorter and 80 lbs lighter than him push him to other places. Wow I am glad we won that one. Whew! Just to harp on something completely different, did anyone else see the play where Alston passed into Yao (funny that he is the only PG who can), Yao passed back out, slid to the middle to repost while the ball went into the hands of Head. Then Yao slid all the way to the other block, and called for the ball to swing so he could get it in the post again. Bear in mind RAHsheed had four fouls at this point. So instead of swing the ball around and eventually get it back to Yao, Head drives into the paint and is called for a charge. Can we all vomit please? Thanks for the work, as always. calyp, this is a Yao fan club, everyone will be a little biased regarding Yao, but throughout the years, Yao has proven to be the most consistent player on the team. Rafer is way too inconsistent, when he’s out on the court the rocket’s are basically playing 4v5, Rafer’s horribad shooting percentage basically offset’s Yao’s brilliance when Yao gets doubled and dishes it out, oh did I mention Rafer has no D? the same can be said to Hayes, he’s an undersized forward that gives you 4 points a night, that’s a real threat! Rockets need a shake up from top to bottom, starting with dealing Idle-man and Rafer Alston. McGrady is also a good trade bait, I would’ve pushed for a McGrady-Bryant trade, but looking at how well the Lakers are playing I think we missed the opportunity. Yao’s one handed ferocious dunk was pure pwnage, I don’t want to hear anyone talking about soft Yao is, Yao has a shooting touch that’s never before seen from a center, he can play well into his late 30’s if he wanted to. A win is a win, I don’t care how they eek it out, I’m a Yao homer, if I see Yao with 20+ points and a W, it’s a good night. ughhh i think John u r the one who always said the rafer alston for mike james trade was a bad trade so who is fixing on who? james is no PG but rafer is, and the truth is the rox need a PG to run the offense more than a streaky shooter. could we get a better PG than rafer, let’s hope so but for now he is it. I still say it was a bad trade, but Mike James was not traded to be the starting point guard. The rockets already had one. His name was Bob Sura. Even back then, James was not expected to be the starting point guard. We missed James after he was traded because the team couldn’t score. For the umpteenth time, James has always been expected to be more of a scorer than a PG. people get confused that because he’s short, he should be a PG. Thank goodness for DVR let me tell you. I analyzed the game and the rockets should have lost that game, but luck shines on us once again! I like the fact that it appeared that Tmac didnt take too many shots, but his shot selection at times is still questionable. I’m tired of people saying Yao’s how much taller than the other players. Due to his short arm lengths, Yao’s standing reach is actually not that high compared to some of the other NBA players. And I’m a basketball player, I know it’s not height-advantge, it’s actually standing-reach advantage. I’m 6’2 and my standing reach is 7’6”, but if there is a guy who’s 5’11” and reaches 7’6” standing up, I would have no advantage over him. Yao might only have a few inches over Shaq or Dwight Howard or Bynum in standing reach, assuming he reaches higher than them. The NBA needs to measure that. Yi is long and has a long reach for his height. He did pretty good with his block shots. In the first 10 games he average about 2 blocks per game. His team won against Orlando and he did pretty good score 18pts on 7 of 11 shooting. ^Quote^ That’s so true. Yao’s standing reach actually isn’t so high for somebody his height (the last time I’ve checked it was only 9,7″ or 9,8″). But standing reach also has to do with shoulder height not just arm length obviously; people of the same height can also vary in shoulder height not just arm length, too, and apparently Yao doesn’t have very high shoulder height for his height, too. Players like Shagari Alleyne (7,3″) and Jaber Rouzbahani (7,4″) actually have higher standing reaches than Yao because the only reason Yao’s taller by an inch or two is from having a longer neck and taller head and his arms are also shorter too. I don’t understand what’s the big deal people have with listing their heights more than they actually are. It’s not like the top of your head is useful anything in basketball; maybe in soccer, the top of your head might be useful for something but not in basketball (and volleyball, too). Your true basketball height is your standing reach not how tall the top of your head is. Shagari Alleyne hight is 7,4″- wingspan 8,5″. One of the NBA teams should give him a second look. Shagari Alleyne is really really big…and he’s an enormous head! Yeah they he’s ‘only’ 7,3″ but i swear he’s taller than that…he’s probably closer to 7,4″ than 7,3″. Shagari Alleyne can reach the rim while standing flatfooted I believe although he’s shorter an inch or two than Yao his wingspan is 8 feet. So in standing reach he’s taller than Yao. Yao has short arms for his height. At 7,6″ he should be able to touch the rim flatfooted which he can’t because his wingspan is actually less than his height.